Auction Dinner - Welcome CABOHOLICS! AT THE MEET & GREET! Deciding on where to have our dinner was not an easy task! Considering the venue had to be large enough, the location had to be convenient to those visiting, the price had to be affordable, and of course the service and food had to up to par! Considering all those factore, we've chosen Desperado's Restaurant & Cantina! If you have never been to Desperado's, you might want to check it out! Here's a little about them, you can also check out their WEBSITE and FACEBOOK PAGE to get more info! "Desperados Restaurant & Cantina is a Mexican Restaurant & Sports Bar.We have the best tortilla soup, fajitas, BBQ pork ribs, and fried ice cream in Cabo! 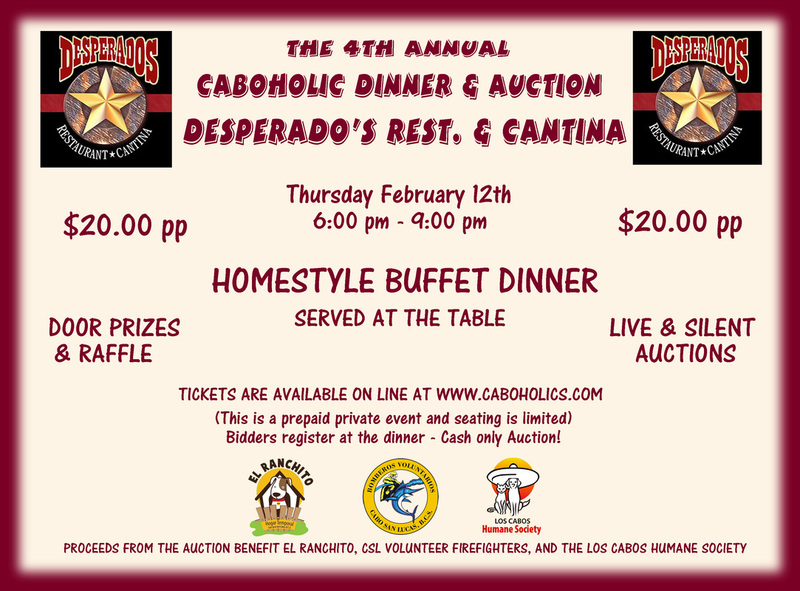 Desperados offers inside dining, bar, upstairs lounge, outside terrace dining options, childs menu, Margarita, Wine, and Dessert menus available. We have 10 flat screen TV's to watch your favorite sports on, 7 on the main floor and 3 upstairs in the VIP lounge area. If we cannot find a game on one of the TV's, we can stream it onto a laptop. We get all the PPV UFC and Boxing events!